The “Pure”-maxi was a real strong appetizer to await the 2nd full length of Endless Shame. Let’s face the truth, Sweden has been always one of the uncontestable leading countries in producing good synth-pop music. We are all reminded of bands like Spock, Elegant Machinery, State Machine etc which were real famous bands during the 90s. In times of world-wide economic crisis and illegal download platforms it’s no longer possible to get bands with the same number of sales. Endless Shame however can be tipped as one of the next possible leading formations in synth-pop land. I think their new album has an impressive potential to satisfy the pop lovers. “Pure” (linked to TV performance of the Demo-version) is a judicious choice to open the album. The song is a familiar one (if you already heard the maxi) and brings all requested and successful ingredients of good pop music together. It’s a carrying and melodious piece of music that will push the listener to dance. I still like the bass line of the song, which is terrific. Next comes “My Creation”, which sounds in a similar vein. “Pure” (linked to sound clip) remains the absolute hit, but this other song has a very strong appeal as well. This is goodmusic led by a talented pop vocalist. On “Holy Ground” Endless Shame are like mixing pop and soft EBM forms reminding me a bit of And One. The bass line of this song is once more outstanding while the sequences will give you a good mood feeling. “No Tomorrow” shows an elaborated song writing with noticeable soundsculptures. Next comes “Sweet Illusion Part 2”, which is without a shadow of a doubt the other potential ‘hit’. The carrying chorus is pure sensory joy. The song has been reinforced by guitar riffs, which is damned good idea. This is the kind of song all synth-pop lovers will be pleased with. 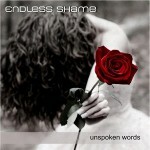 The last part of “Unspoken Words” is dominated by another familiar song. “Jericho” is another extract from the “Pure”-Mcd and brings this album to a last real apotheosis. The carrying melody line is once again well-crafted and sensational. This album confirms all the potential of this band and I definitely think this is the newest sensation from the A Different Drum stable!